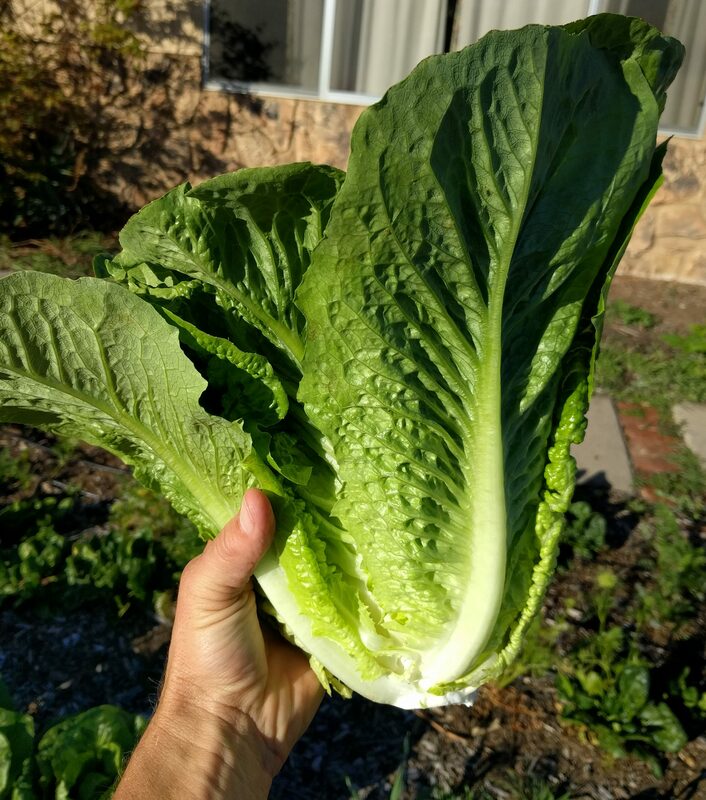 Gardening as sport: This year, I took the challenge of growing more lettuce than my brother’s family could eat. He and my sister-in-law fuel their family of six with a quasi paleo diet, which includes a lot of lettuce, and they would be spending a week at our house in late February. So a couple months prior, I began sowing lettuce seeds in order to have an abundance in the garden, ready to harvest during their stay. 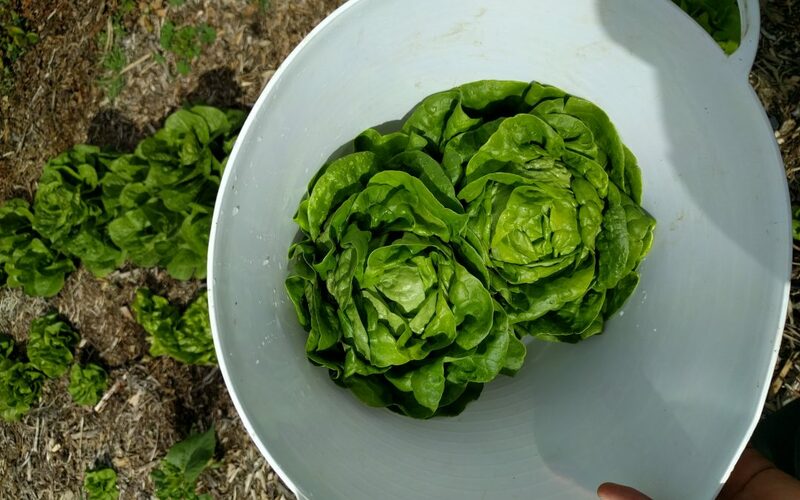 The great dividend from taking on this challenge has been learning more about successfully growing and harvesting lettuce than in any previous year. 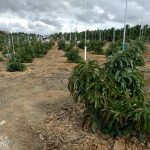 It was good for me to have the pressure of producing a certain kind of crop in a large quantity at a specified date. I felt like a contracted farmer. What follows is not a general growing guide for lettuce, but rather a collection of the few most important strategies I’ve discovered, especially those that I think are particularly useful in Southern California conditions. Lettuce likes it cool. I start sowing at the very end of summer. This last year, my first sow date was September 15. This way the plants are up and growing during the early fall when temperatures are mild. 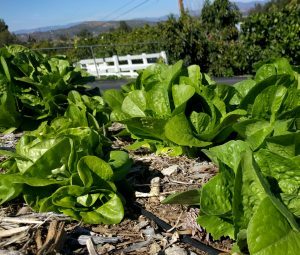 If you really need homegrown lettuce through the summer, then you can choose heat-tolerant varieties and sprinkle them with water during the afternoon on warm days to cool them down. It kind of works. 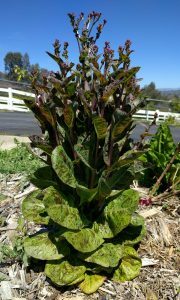 But summer lettuce often tastes more bitter, and it takes much more effort than winter lettuce here in Southern California. My routine is to follow lettuce’s preference and take the summer off. I no longer sow lettuce directly in the ground. I now sow it in module trays indoors — on a counter in my garage. The benefit of this is that you don’t have to work hard to maintain soil moisture. Lettuce seeds must be sown very shallowly. I don’t even bury them, but rather I merely press the seeds into the wet soil surface and then lightly water. Done. Within a week they’re up and growing without any additional watering. If you sow outside in the sun, you have to water unless we’re in a period of consistent rains or you’ve sown into a mulched surface. 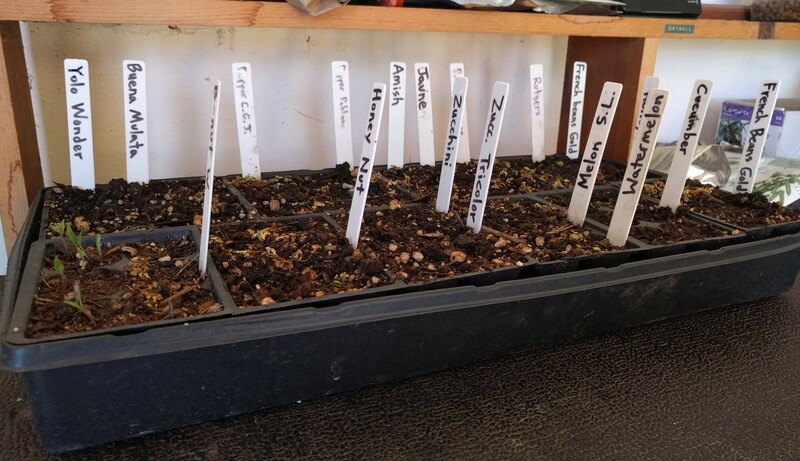 After seeds germinate, they go out into the sun to grow for about a month before being transplanted into the garden. 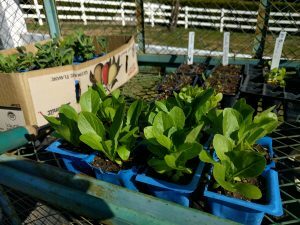 It is expensive to buy lettuce seedlings at the nursery in comparison to peppers, for example. One pepper plant will produce oodles of peppers all summer and fall, but one lettuce plant can be consumed in a single meal. So I sow lettuce seeds rather than buy seedlings. I also save some of my own seed. Just choose a good-looking plant to allow to bolt. It will make more seeds than you are likely to want for all of next year. 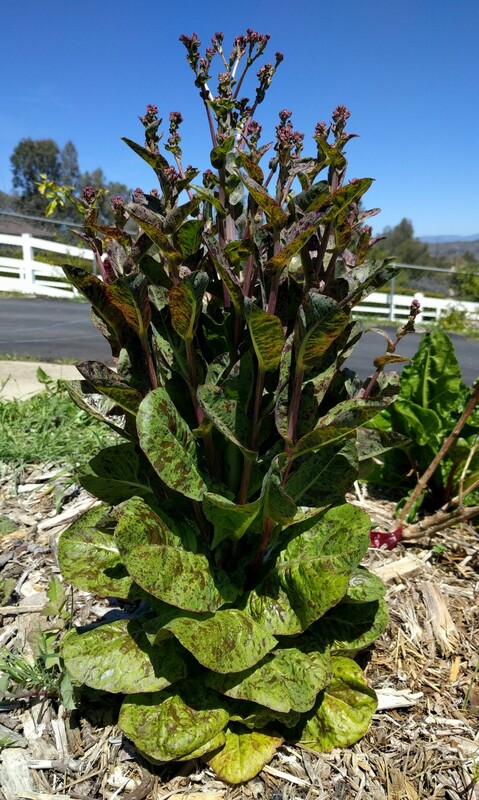 Here in spring is the perfect time to allow one of your lettuce plants to go to flower. Once its seed capsules are a little dry, cut them off and stick them in a paper bag until September. The seeds will almost certainly grow plants that are identical to the mother plant. This plant itself is from seed I saved last winter. I’ll save this seed for next winter. 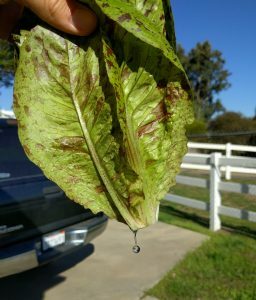 It’s said that the reason lettuce is sometimes bitter is because of hot temperatures and/or lack of water. 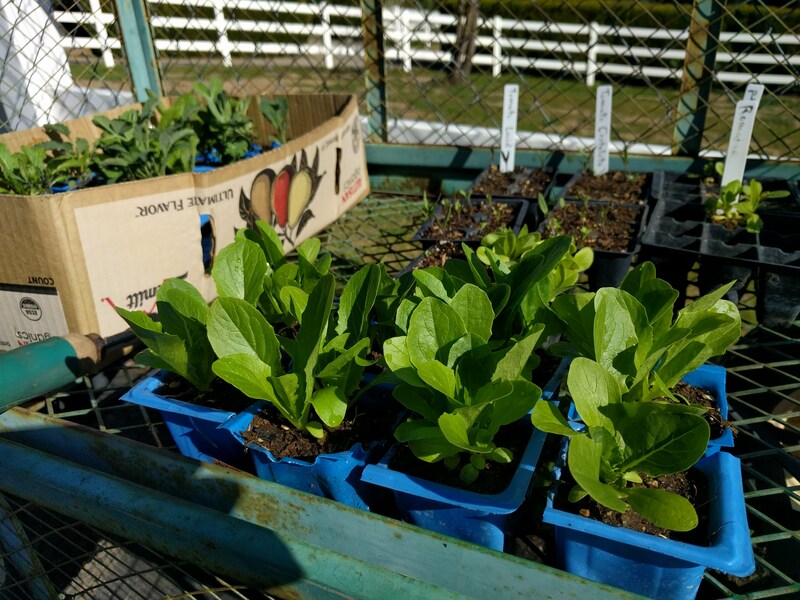 So be sure to not let your soil dry out, of course, and if there’s a Santa Ana spell in January that gets to 80 degrees then sprinkle lettuce plants in the afternoon to hydrate and cool them. 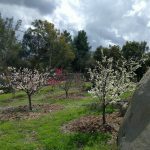 But more effective and efficient is to cover your soil with some kind of mulch. I use compost or wood chips. Both keep the soil cooler and more moist than bare soil, in addition to enhancing the soil’s fertility. This past winter was not exactly chilly, remember? It was also not wet. Despite these conditions that are uncomfortable for lettuce, I only watered every two weeks. I kept thinking I’d need to water more often, but upon scratching the soil surface I found moisture in abundance at the level of the roots, so I refrained. None of my lettuce tasted bitter. I believe the reason was the mulch. Another splendid byproduct of having mulch under my plants was that they kept cleaner. When I watered or when it did rain, little splashed up onto the leaves. That’s great because I hate washing garden produce. I want to harvest it and eat it straight away. 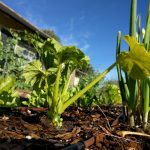 But a little dirt always does get on those lower leaves, and since dirt is crunchy, I simply remove a few lower leaves and send them to the compost or chickens. 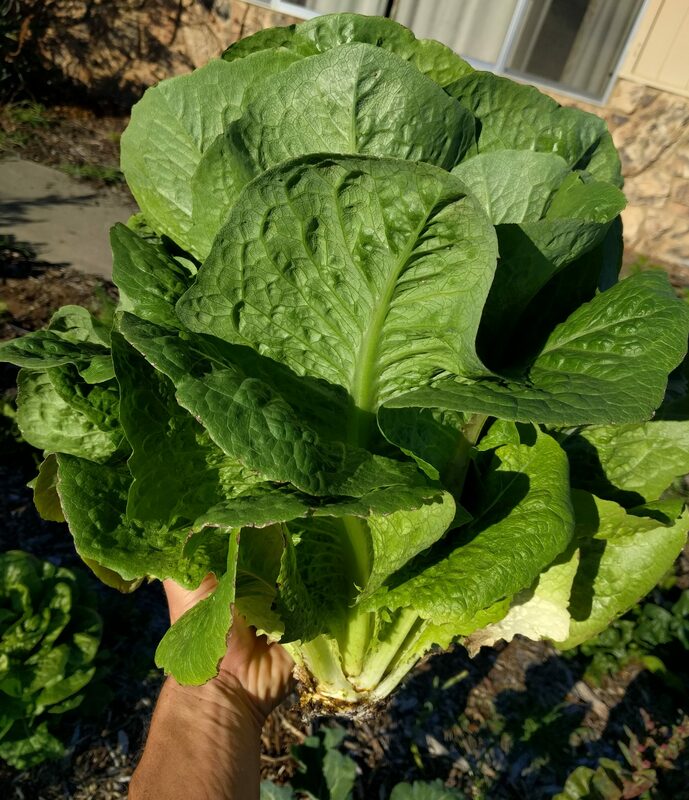 Romaine cleaned up; no need for washing; ready to eat. 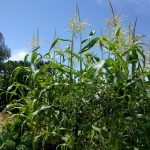 If a whole plant is harvested, then after removing the lower leaves and cutting off the dirty stem, milky sap flows from the cut. Dip the cut end in water and it both rinses off the sap and stops the bleeding. 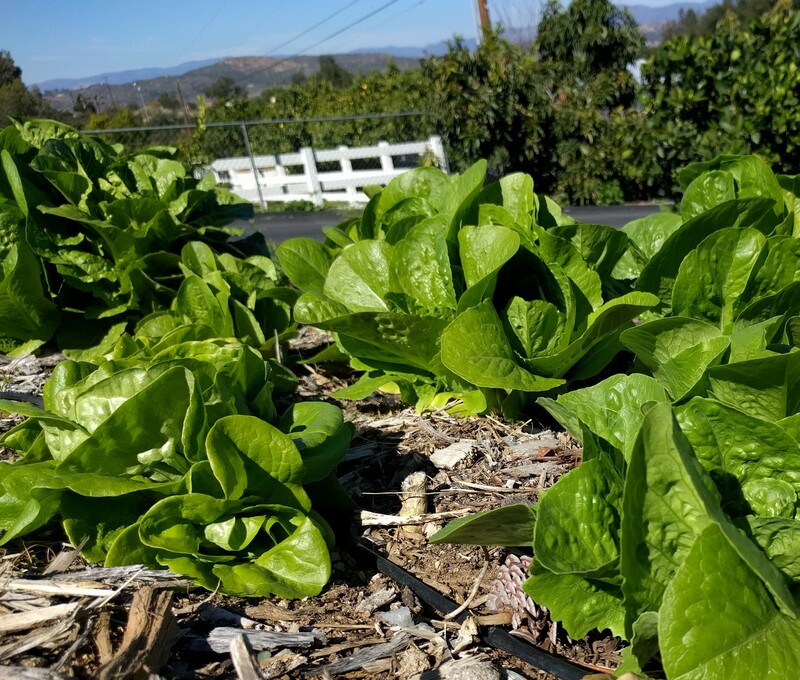 The best time to harvest lettuce is early in the morning. The plants are turgid at that time, and because of this they can remain full of water and crisp in the fridge for a couple weeks. Yes, a couple weeks. But sometimes you don’t plan properly and just have to have some lettuce with lunch straight from the garden. In that case, taking the plants straight from the garden into a bowl of ice water in the kitchen works sufficiently. This practice farmers call removing the “field heat.” The result is that the leaves perk up and taste good rather than being limp as they otherwise would. Far more efficient though is if you harvest in the early morning and harvest more than you’ll eat that day. Each time I harvest, I try to harvest enough for the next week or two. And before refrigerating, I make sure the leaves are dry or close to dry or else they become soggy within days. I won! I mean, we all won. My brother’s family didn’t eat through the quantity of garden lettuce I produced (and I’m pretty sure it wasn’t because of quality), and now my own family is left with leaves upon heads of remaining butter and romaine and purple freckled Lactuca sativa. 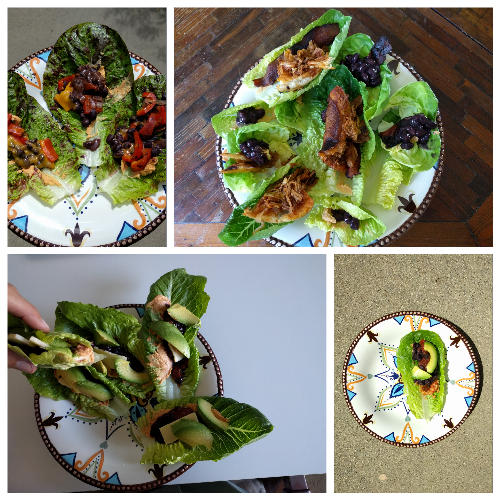 Lettuce tacos! I’ve been eating them almost every day for lunch. Put any combination of ingredients onto a leaf, fold and deliver. Who needs tortillas? Thank you for sharing. The lettuce looks beautiful. You have encouraged me to start. 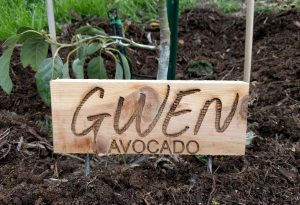 Melanie on What’s the best kind of avocado to grow?